Skirt tree Color：Khaki Burlap Pattern: white snowflake Printed Side Color: red and green plaid With Golden silk Adornment：Gold edge Glitter Feature： 1 .Protect your home from pine needles and tree sap with this beautiful decorative tree skirt. 2.Burlap tree skirt with classic Christmas element and vibrant red and green edge, add your Christmas tree with more vibrant. 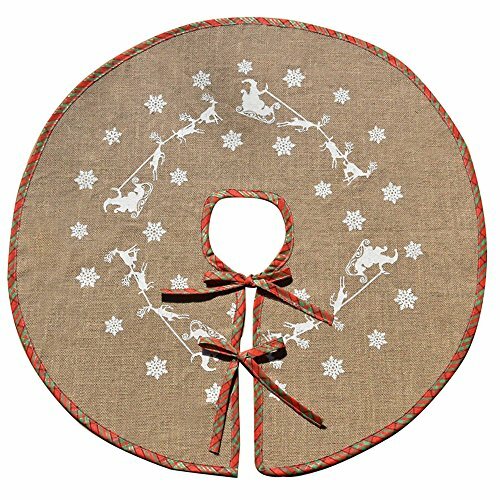 100% high quality Jute burlap with classic white snowflakes, Santa and deer print, perfect for Christmas tree decor, add more joyful atmosphere to the holiday. 48" large size suits for most size of Christmas Tree, and you can put the gifts you like on the tree skirt for more holiday decorations. Two plaid ties at the opening make it easy to fix and lock, allow you to secure tree skirt around and in place underneath the Christmas tree. You can tie it as the knotbow to make it more attracting.